If there's one thing we know, it's that the worlds of politics and fashion are very much alike. You're in one month and out the next, appearances are everything, competitiveness abounds and the general public has a distinctly love-hate relationship with both. History shows us that fashion is ruled by politics, and politics are inextricably linked to fashion. One woman that knows this more than most is Hillary Clinton, first lady to Bill Clinton back in the '90s and subsequent Democratic presidential nominee. You can't deny that women in politics have it harder when it comes to dressing—they can't just throw on a suit and run a comb through their hair before making a big speech. But back in the day, Hillary knew how to put together a polished look, a set formula that got her through every public appearance. 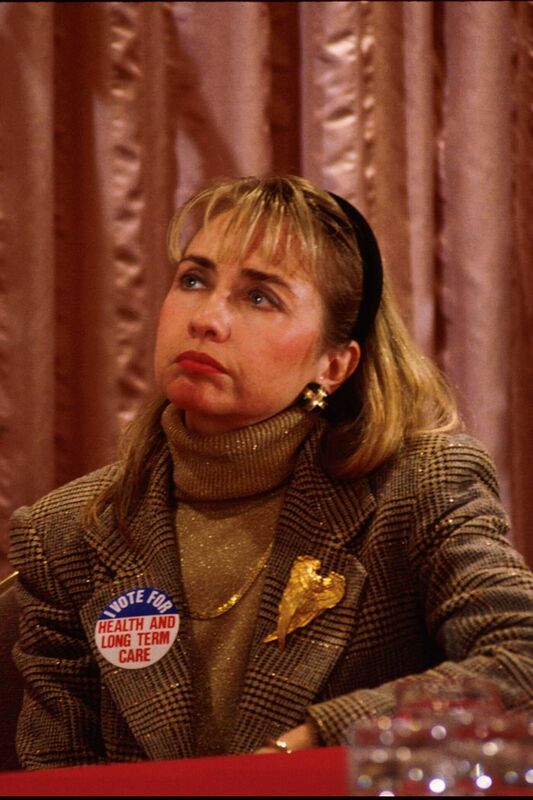 Incidentally, Hillary's throwback outfit formula happens to be exactly what we want to be wearing right now: headbands, blazers, statement earrings and roll-neck knits. Clearly, the politician was ahead of her time. She even threw in a little tonal dressing—what could be more 2019? So if you're a tired of the repetitive nature of Instagram fashion, journey back with us to the '90s and discover new-season style inspo courtesy of America's former first lady. Style Notes: Hillary's opted for muted tones in this checked blazer look, but the gold roll-neck and statement jewellery adds interest. Make this 2019-worthy with an oversized blazer and Gucci's logo earrings. Style Notes: Before Blair Waldorf, Hillary was rocking the matchy-matchy headband look. A cardigan can be a tricky trend to pull off, but we reckon the below long-line style would look so good with tailored trousers and sneakers. Style Notes: This power-suit ensemble could not be more '90s, but the teal, black and gold colour pairing actually feels quite 2019. We could totally imagine this tonal look appearing on the streets of fashion week this season. Style Notes: Hot pink might say "Barbie," but when layered underneath a black blazer, it gets taken to new heights of chic. A great way to liven up your usual work suit.